My wife would like a 3 wheeled recumbent, but I can’t see how we can transport one with a normal car. I can put my bike on a rack or the roof, but all the recumbent I have seen are too large to transport. What solutions have people come up with? Hitch Rider Trike-N-Bike™ hitch mounted racks transport a trike and bike at the same time. Wheel holder and bike support arm styles are available for the bike carrier position. The rack fits both 1 1/4" and 2" vehicle receiver hitches (patented). 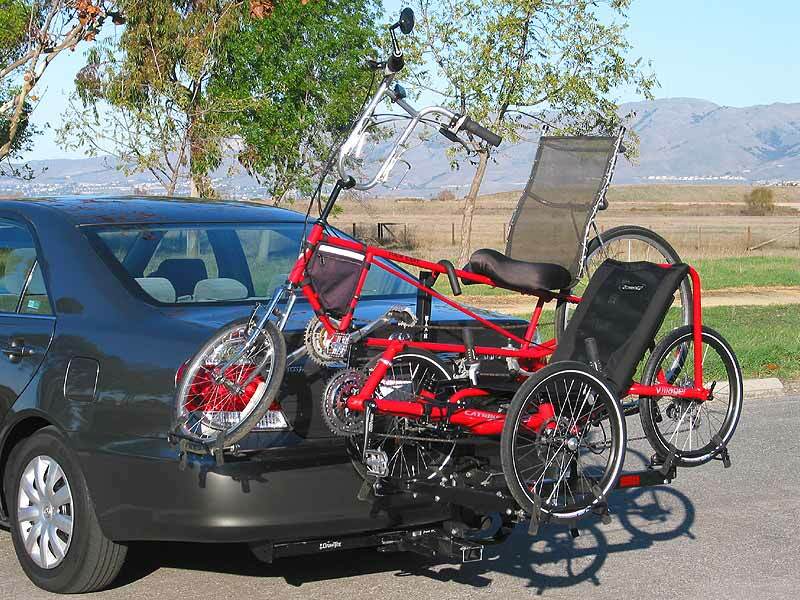 My inlaws ride recumbent bikes and had a hitch installed on their Toyota Camry and purchased a double-trike rack. Firstly I've seen a variety of trikes on the roof of a fairly wide variety of cars - hmm, I've carried one on the roof of mine along with two recumbent bikes, so its perfectly possible to carry a trike on a car. The challenge - as it has always been with recumbents - is that you may not be able to do so with a single standard piece of kit. From memory wheels either side of a set of roof bars being quite a common solution (challenge being getting the thing up onto the roof in the first place). Similarly Hase have taken steps to make it easy to break a KettWiesel down for transport. Pragmatically, if you can find your way to an HPV club event (e.g those run by the BHPC in the UK) you'll be able to see and ask people who will have addressed this problem. Put the seat back as far down as possible, to reduce drag. Strap down fenders and anything else that's loose with velcro. Put cargo straps through the trike tires to strap the car to the roof. Greenspeed GT3 (Australia), HP Velotechnik Scorpion FX and ICE(UK) make folding tadpole recumbent trikes, which can fit in the back of a reasonably sized car. TriSled (Australia) make one with a break in the frame that serves the same purpose. Not the answer you're looking for? Browse other questions tagged recumbent tricycle transport-by-car or ask your own question.